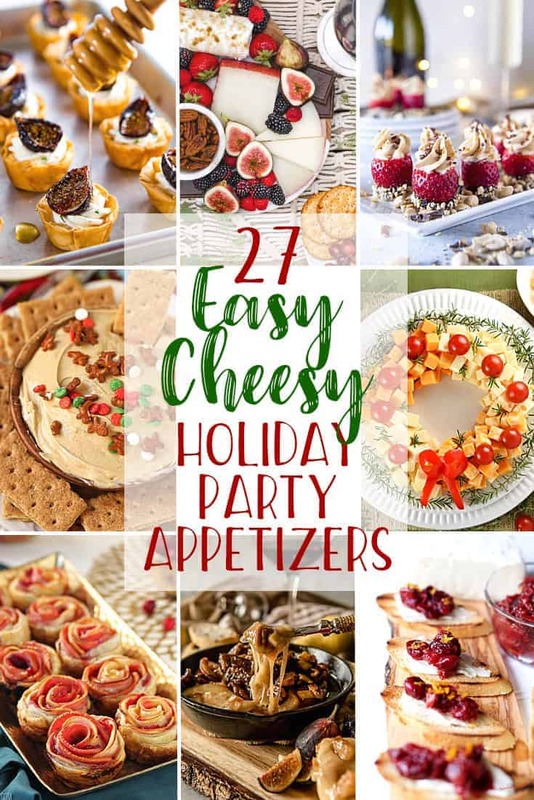 Be the Host-With-the-Most or Best Guest by sharing a few of these 27 Easy Cheesy Holiday Party Appetizers at your next gathering! From super cheesy to more savory to desserts, there’s a little something in here for every cheese lover! I don’t know how, but the holidays are most definitely upon us. 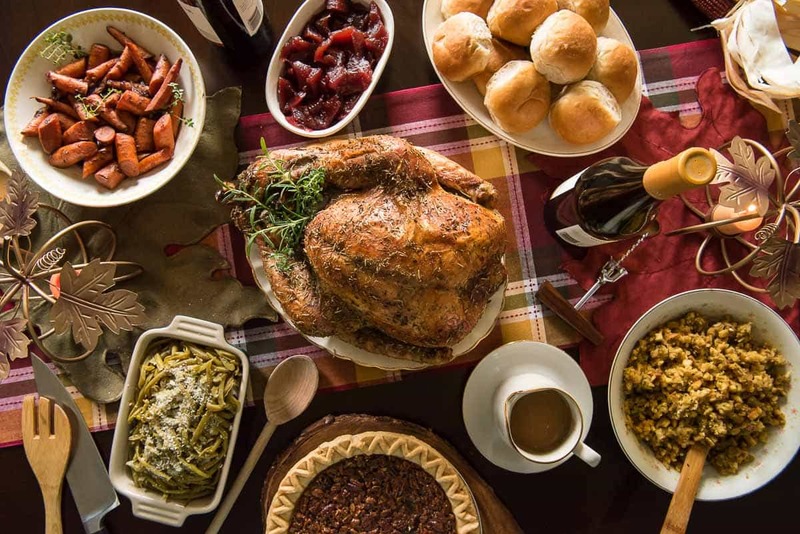 Have you begun to think about those Thanksgiving and Christmas Day menus??? Are you more of a classic meal-eater – turkey, mashed potatoes, and cranberry sauce? Or do you like to mix it up with fancy Beef Wellington, boozy vegetables, and a big table full of pre-dinner finger foods? Coming up with appetizer ideas for holiday get-togethers can be mentally exhausting, boring, or both. Luckily, we’re coming through for you today to help stave off the boring. We’ve put together a couple dozen of our favorite beautiful, impressive, and easy appetizers for Thanksgiving, Christmas, New Year’s Eve, and every holiday party in between! We’ve also included tips on how many appetizers you’ll need for your guest list, and included some of our favorite tools to help display them so you can wow everyone! How Many Appetizers Should I Serve Per Person At My Holiday Party? The amount of appetizers to serve per person at a party depends on the style of party you’re having, as well as your guest count. For cocktail party-style gatherings, serve a mixture of light and heavy appetizers to whet appetites. 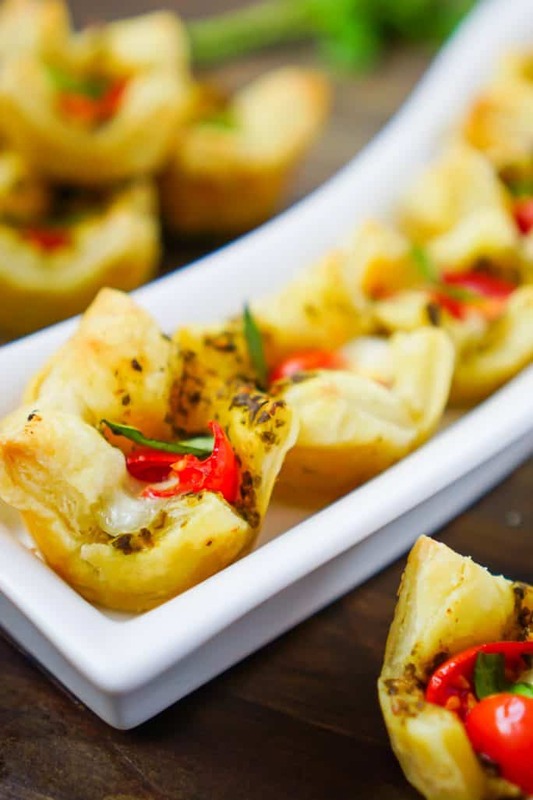 To determine how many appetizers are needed from each recipe, follow the caterer’s formula. For a guest list of 15 or less: choose between 3-5 appetizers. If you’re expecting 15-45 people: choose 5-6 different appetizers. For 45+ guests: choose 8 different appetizers. For a dinner party, choose 2-3 different appetizers and have enough for about 6 per person – just enough to keep their hunger at bay before the main course. What Is The Difference Between A Light and Heavy Appetizer? 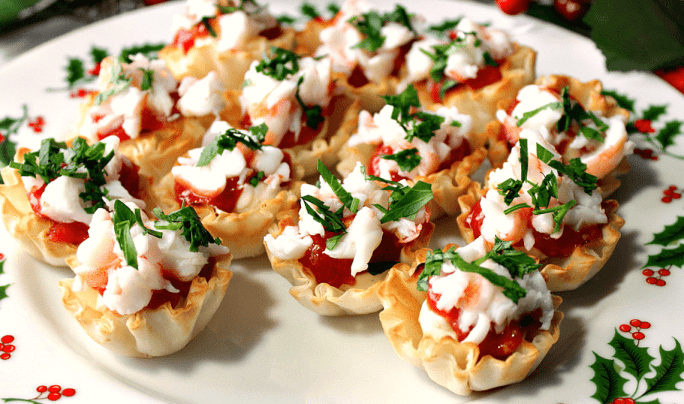 Light appetizers are what this list is comprised of – finger foods that can be consumed in 2-3 bites. 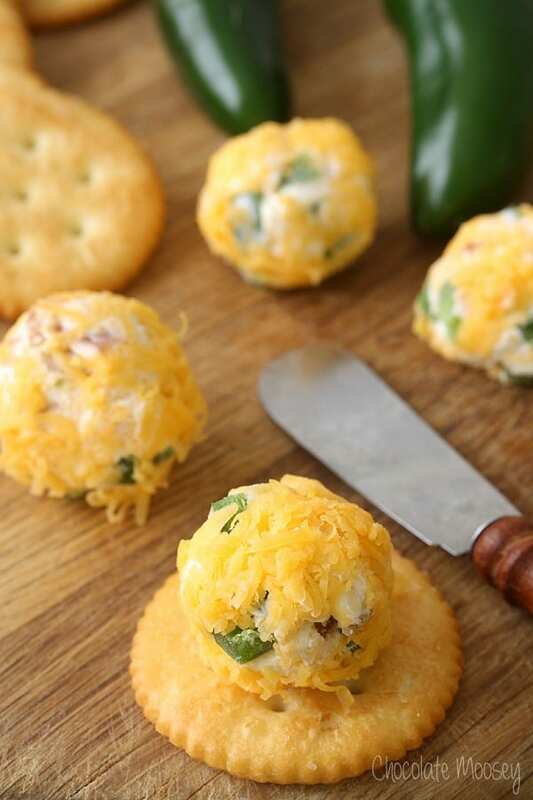 They are ideal for cocktail parties and pre-holiday dinner nibbles. Heavy appetizers are generally heartier, more filling small plates that can be used in place of a plated meal. They usually include a protein and are larger than two bites, often requiring a fork to eat. What Are Some Essential Tools and Serving Ware For A Holiday Cocktail Party? 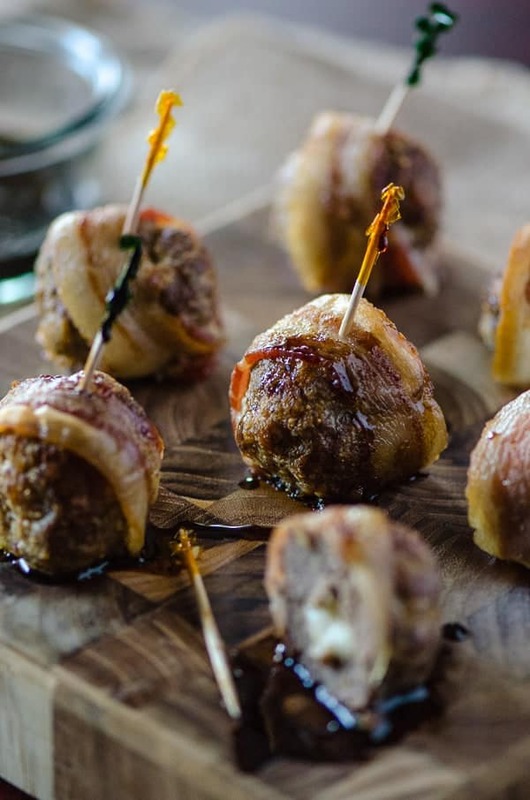 Now without further adieu, let’s get to these appetizer ideas! 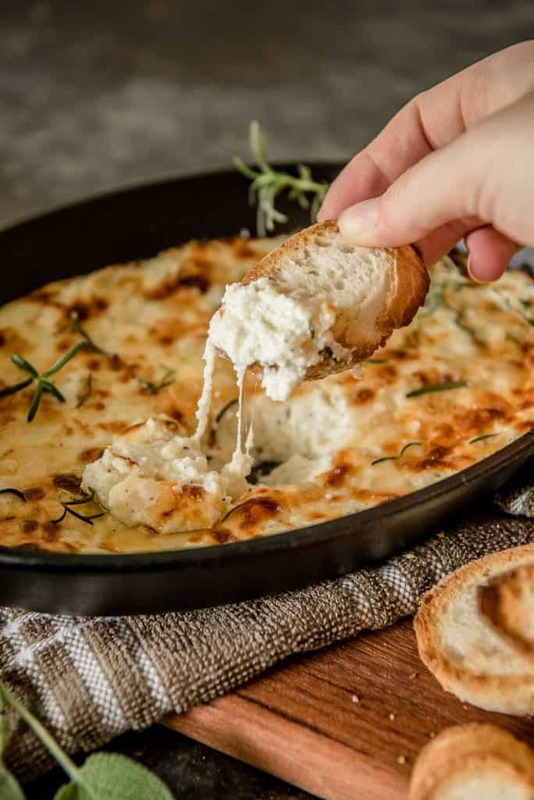 Salty, cheesy, and warm, welcome guests into your home first with my Baked Ricotta Dip. Crackers and bruschetta make wonderful vehicles for this deliciously easy appetizer. 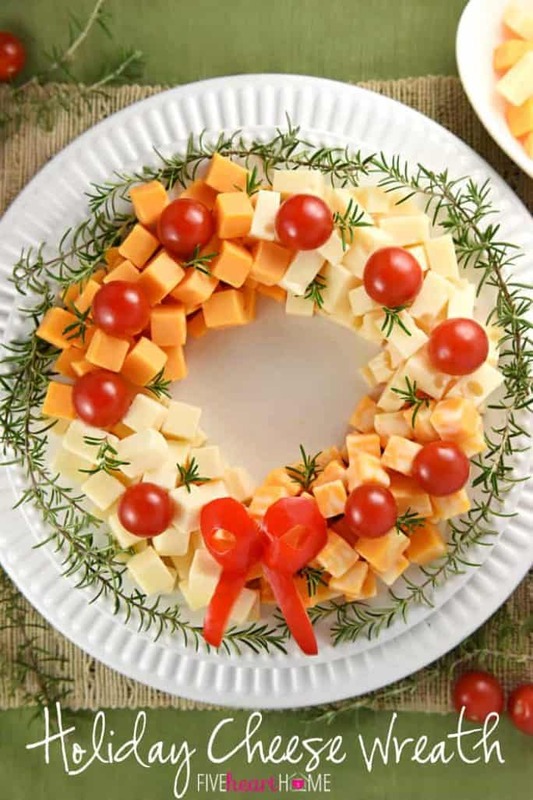 Wreaths are appropriate for all winter holidays, especially when they’re edible like this Holiday Cheese Wreath from Five Heart Home! 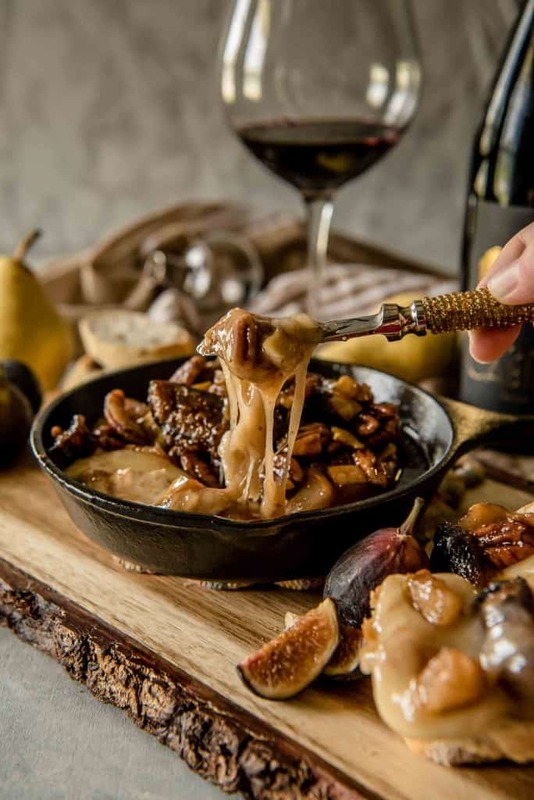 Warm, cozy, and comforting are the best words to describe my Brown Butter Fig & Pear Baked Brie. Mostly sweet, with a touch of savory from the brie – it’s a must make for any party! 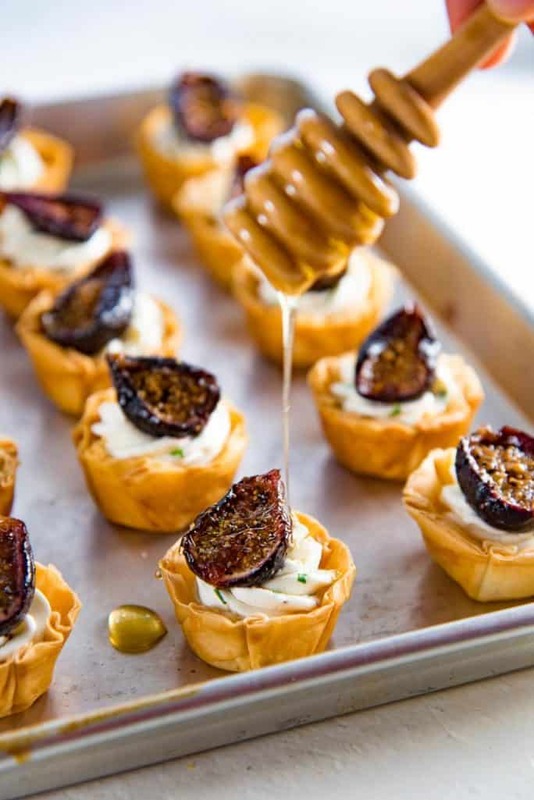 And while we’re talking figs, these pretty little Goat Cheese and Roasted Fig Tartlets from The Flavor Bender will fancy up your appetizer table for sure! First of all, let’s recognize how Eating Richly made the CUTEST cheeseball ever! 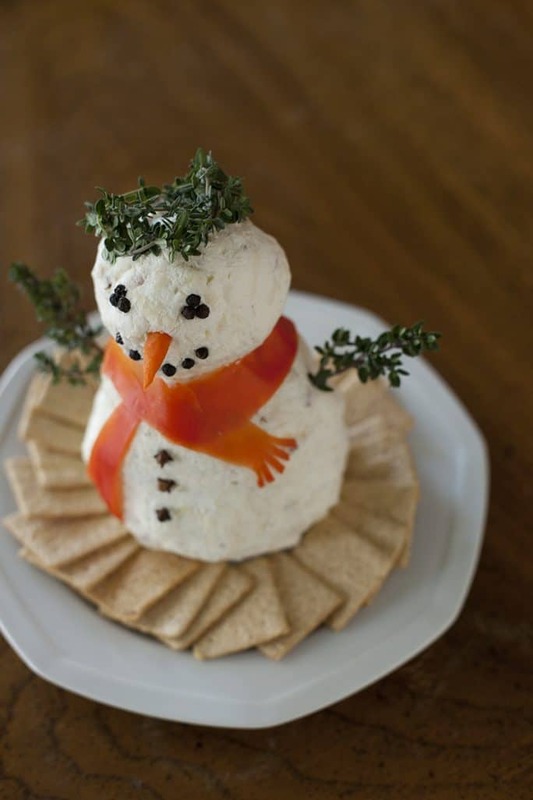 A Christmas Cheeseball Snowman is just right for eating all winter long! So you like your cheeseballs a little bit EXTRA? 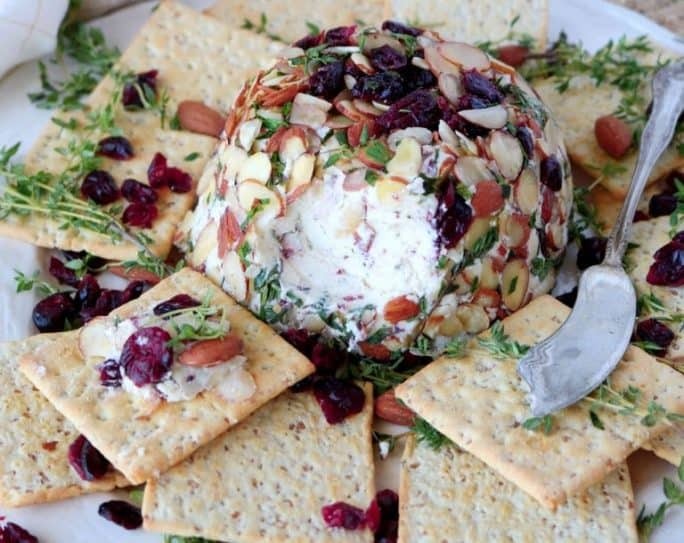 This beautiful goat cheese-based Party Cheese Ball from The Anthony Kitchen is studded with slivered almonds and dried cranberries. 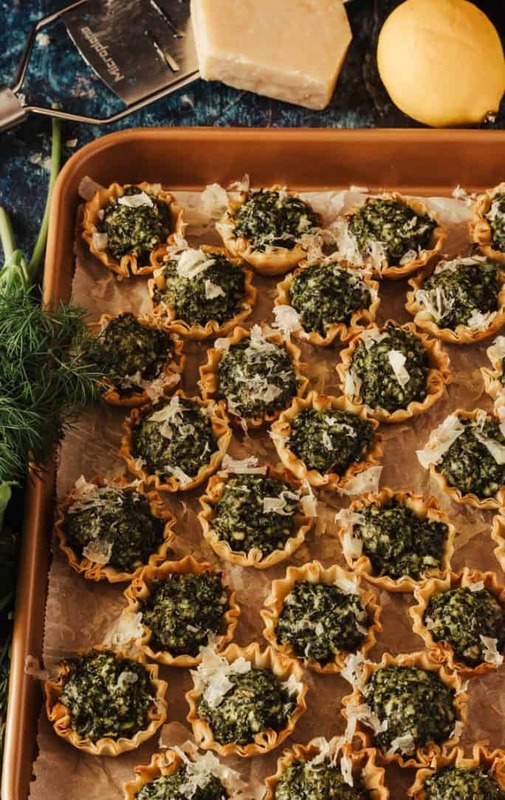 Make it a Greek holiday with a batch of these super simple Easy Spanokopita Bites from Beyond Mere Sustenance. These adorable Mini Caprese Bites from The Love Nerds are a fantastic way to enjoy a bit of summer in the colder months! 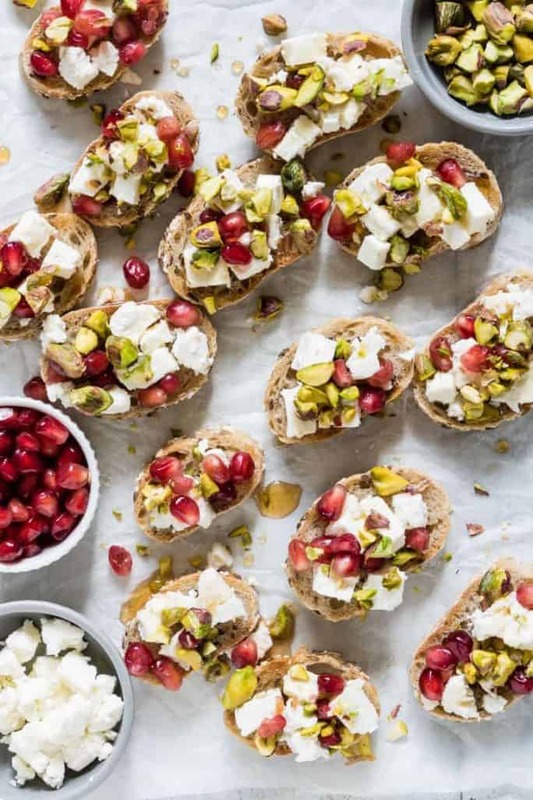 If you’re really into feta, these crazy festive Pistachio, Feta, and Pomegranate Crostini from Recipes From A Pantry will liven up any party. 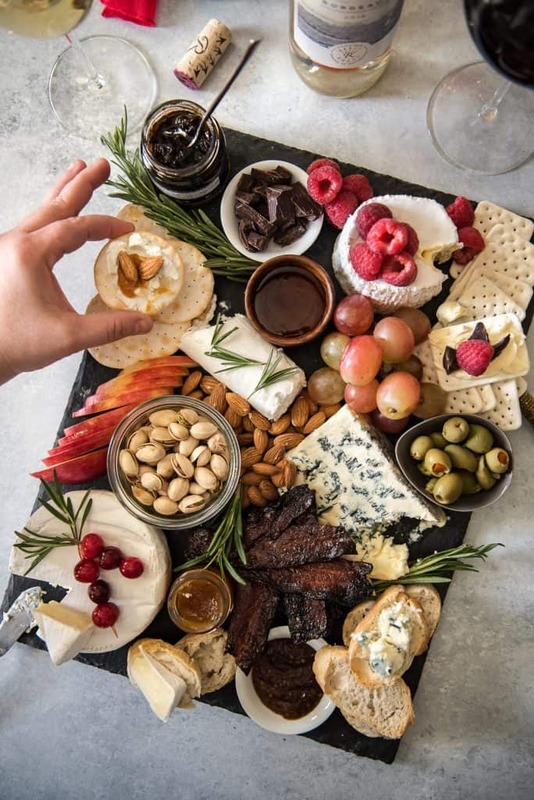 I am all about charcuterie, and nothing brings people together like a spread of all kinds of tasty cheeses, meats, and snacks. My Winter Cheese Board is seasonally sound, and made even more perfect with a batch of sweet-and-spicy Maple Sriracha Candied Bacon. Not enough time to build a cheese board, but still want some of its elements? 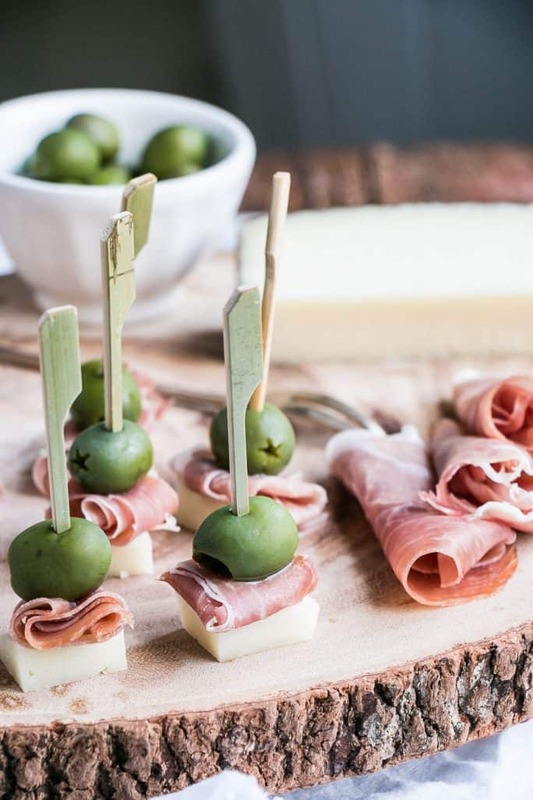 Throw together a platter of these Manchego Cheese, Ham and Olive Bites from My Kitchen Love – your guests will still be impressed, and you’ll have time to relax! 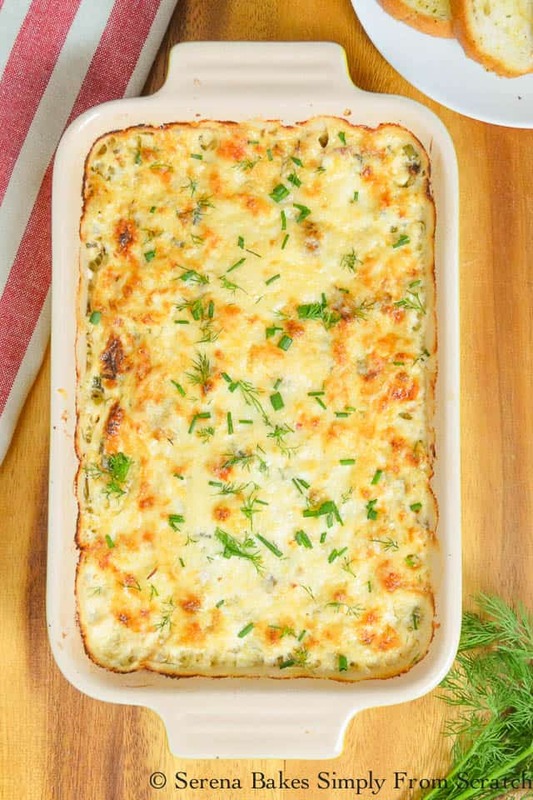 If you like to add a little protein to your cheesy dips, this Hot Crab Dip by Serena Bakes Simply From Scratch will satisfy your cravings! What holiday party is complete without meatballs?! 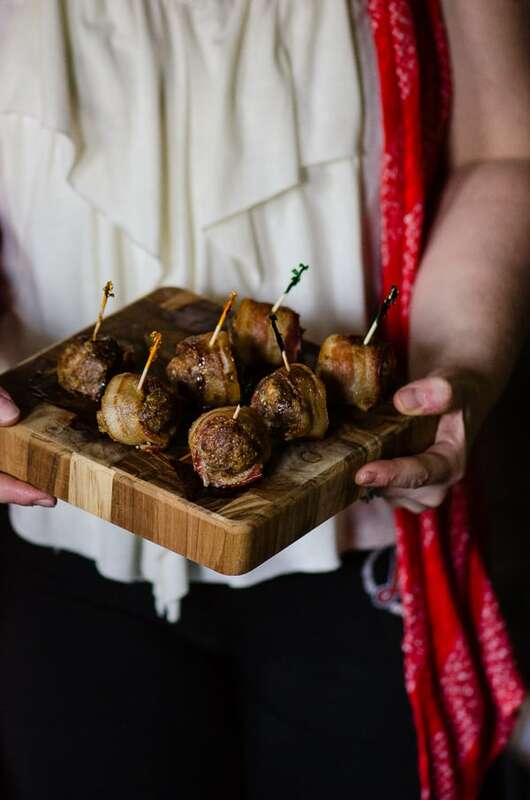 These aren’t served in a crockpot, but my Bacon Wrapped Mozzarella Stuffed Meatballs will delight every guest with their flavor and texture. Not into meatballs? How about some tasty Shrimp Cocktail Bites from Kudos Kitchen by Renee? There’s a tasty bit of lemony Old Bay cheese inside that will really bring these flavors together! 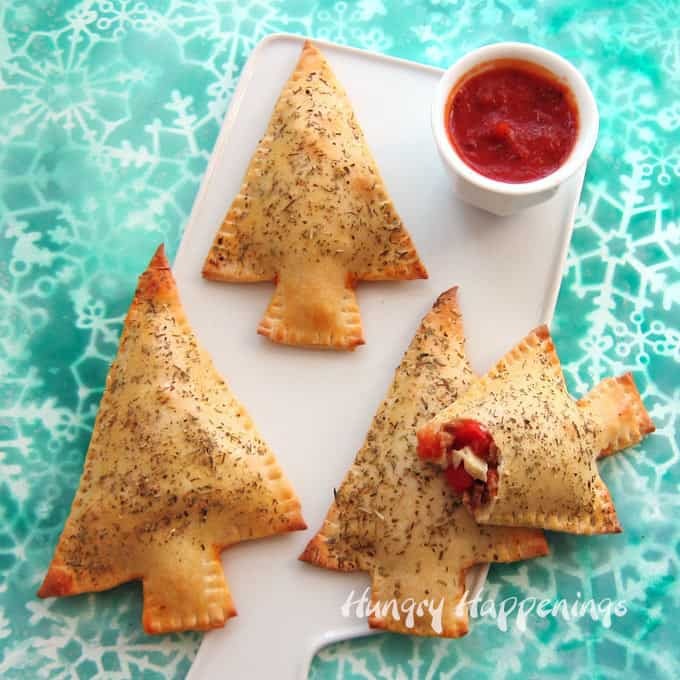 These Calzone Christmas Trees from Hungry Happenings may be perfect for the kiddos, but I’m willing to be the adults will be reaching for them just as quickly! Prosciutto is just classier bacon, meaning these Crispy Prosciutto Cups with Pear & Mascarpone are gonna glam up any appetizer table they land on this holiday season. 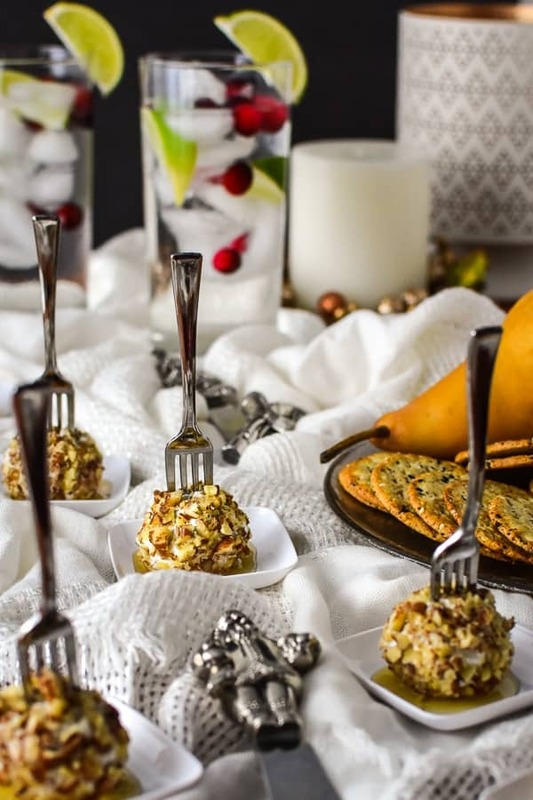 A holiday spread wouldn’t be complete without a platter of cheeseballs, and these Mini Jalapeno Popper Cheese Ball Bites from Homemade In The Kitchen are just the right size with the right amount of heat. How about a BONUS recipe?! 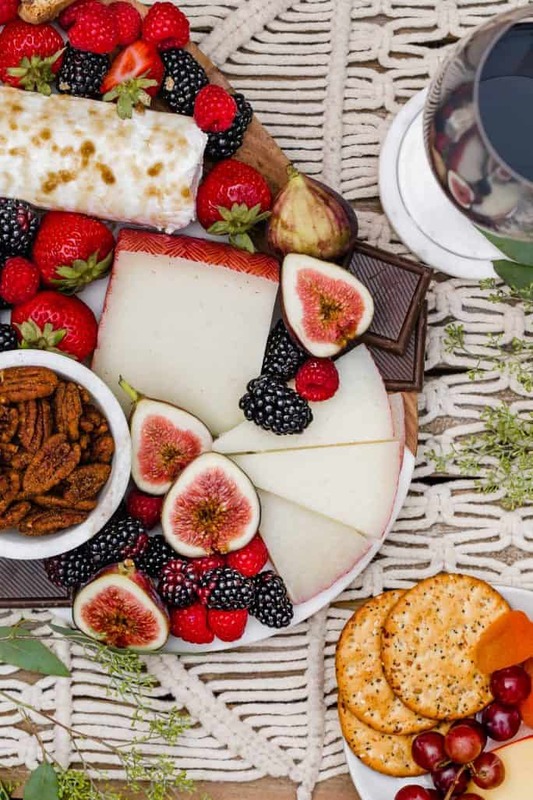 Holiday parties are always full of sugar and carbs, but that doesn’t mean you shouldn’t have options for your keto friends! 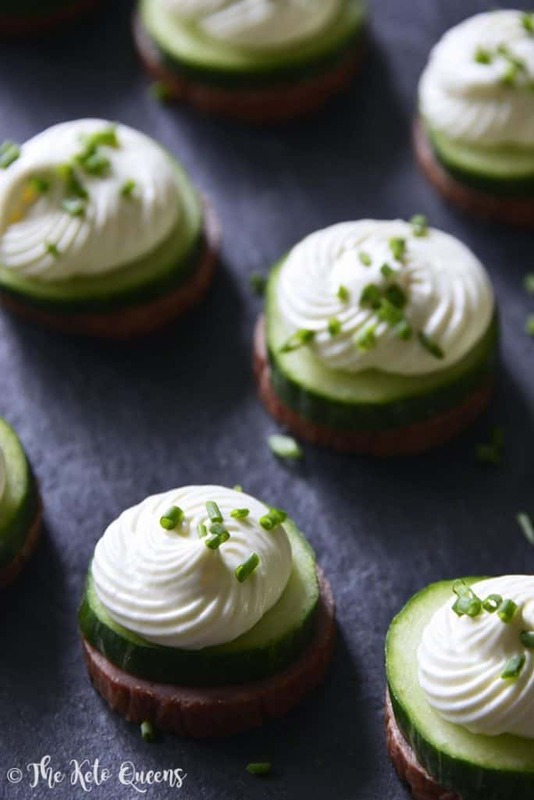 These beautiful Keto Summer Sausage Cucumber Bites with Cream Cheese Mousse from The Keto Queens will thrill your low-carb party guests. I know I’m not alone in craving pumpkin flavored treats in all winter months. 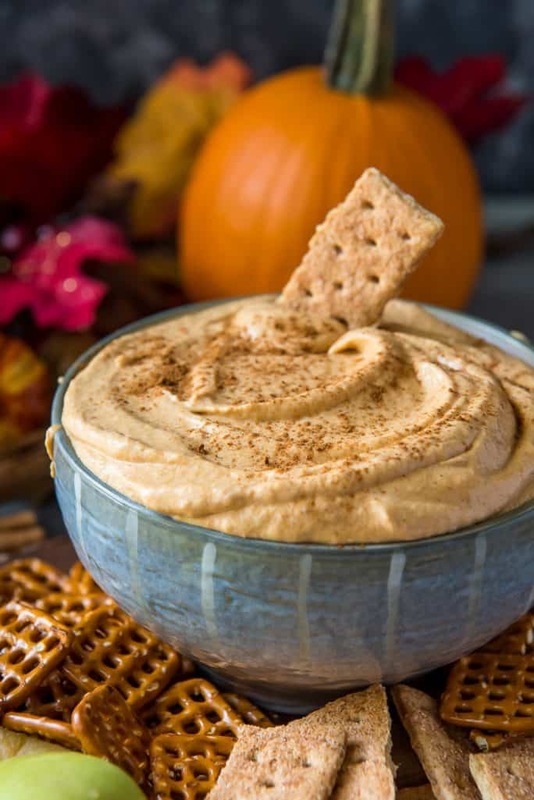 This Fluffy Pumpkin Cheesecake Dip is super quick and easy to whip up for a party or even a night in. Talk about a mouthwatering treat! 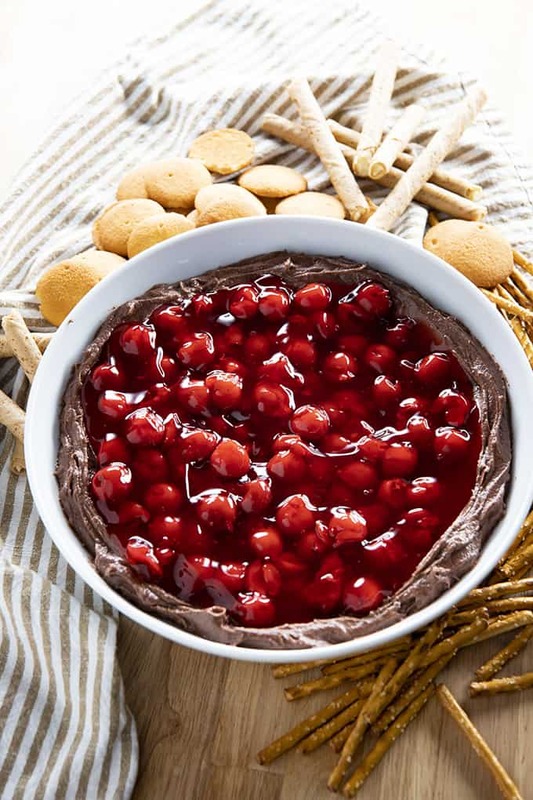 This Creamy Cherry Chocolate Dip from The Salty Marshmallow would be delicious straight from a spoon, much less a dipper. 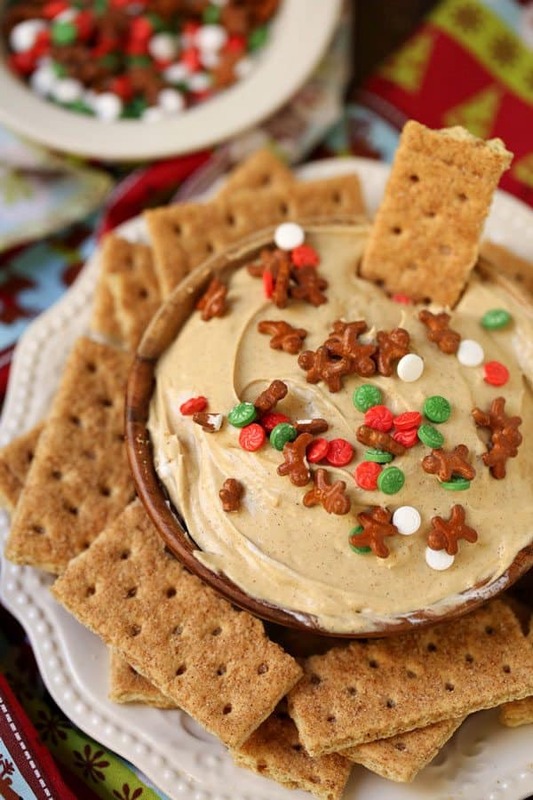 Food, Folks, and Fun knows how to party with this fun and festive Gingerbread Cheesecake Dip! Fancy, fancy, fancy – but oh-so easy! 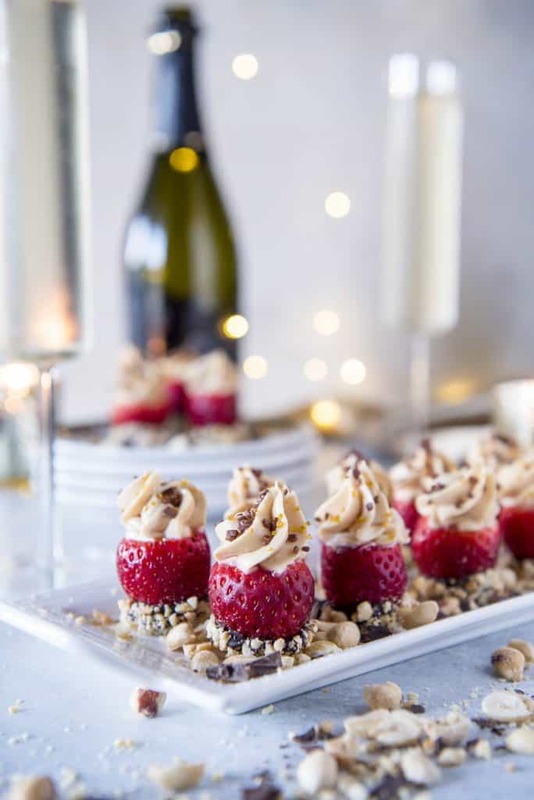 Sweet little Peanut Butter Cheesecake Stuffed Strawberries are a lovely dessert-oriented appetizer for any get-together. 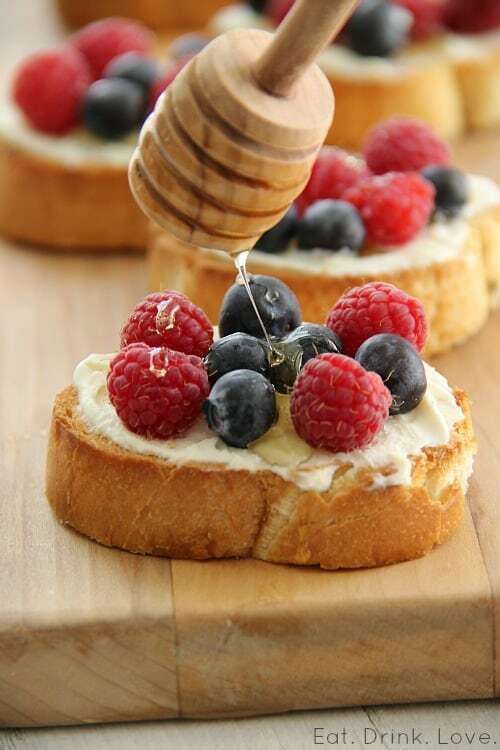 Berries have no season, and these Berry and Mascarpone Crostini from Eat, Drink, Love will brighten up hearts, mouths, and your table! 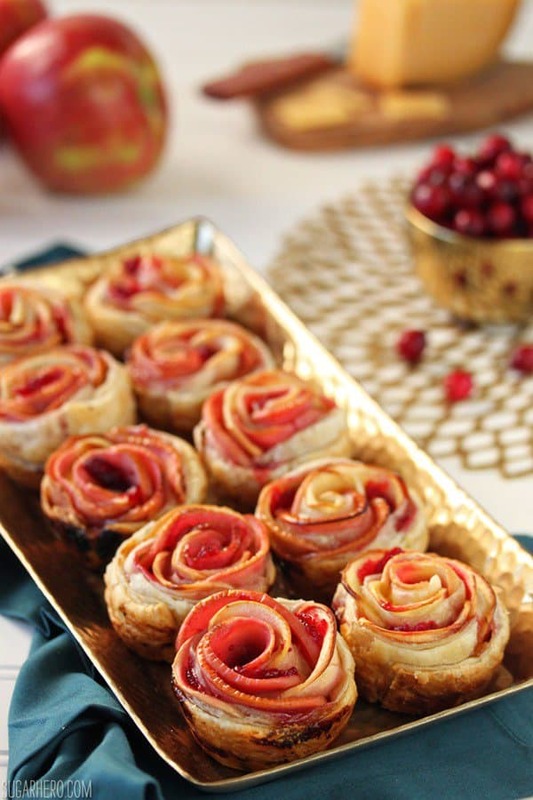 These Cranberry, Apple & Gouda Puff Pastry Roses from Sugar Hero are simply stunning! Can’t you already hear the gasps of delight as your friends and family gather around the table? More pumpkin! 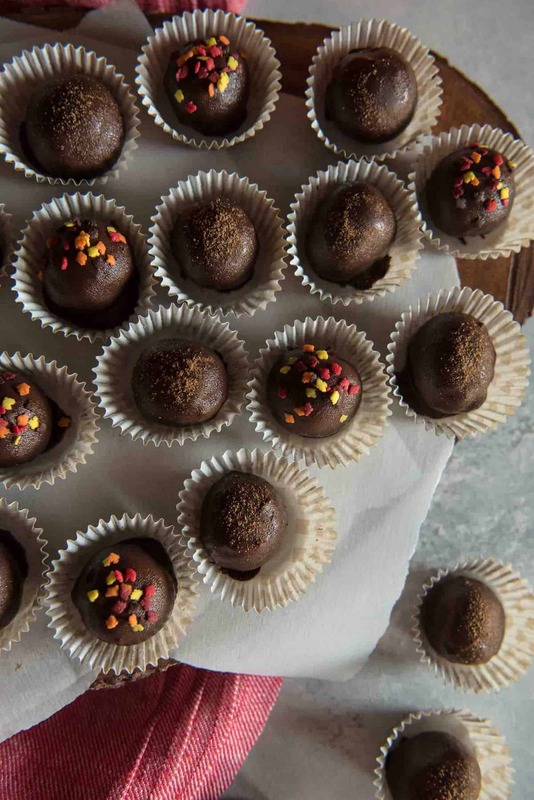 These Pumpkin Cheesecake Truffles could easily go right on the dessert table, but who doesn’t like a little chocolate before dinner? Cheeseballs can also be on the sweeter side! 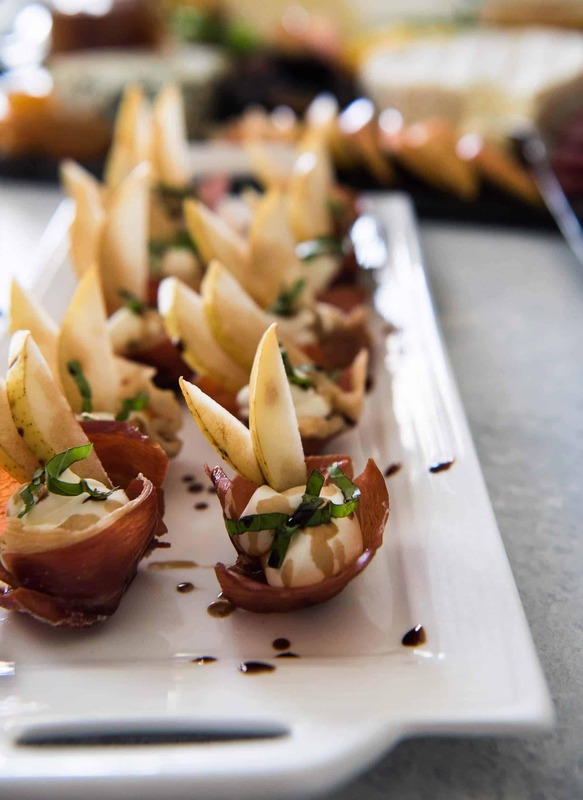 A few of these Mini Pear, Pecan, and Goat Cheese Appetizers from The Foodie and The Fix are appropriately sized for smearing on crackers, cookies, or sliced fruit. 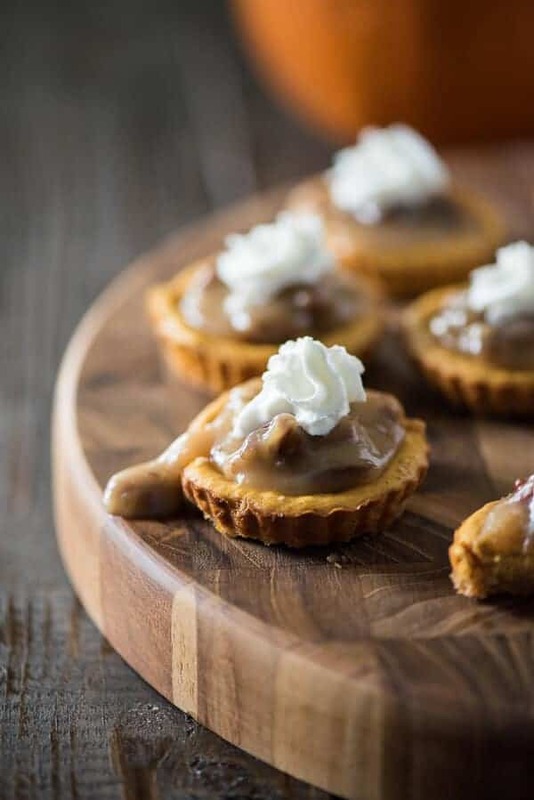 For an even more dessert-like “cheeseball”, one or five Mini Pumpkin Pecan Cheesecakes should calm those pre-dinner sugar cravings. Since I’m a freak for cheese boards, why wouldn’t I be obsessed with the GORGEOUS Dessert Cheese Board by Plays Well With Butter?? I see this happening on my holiday tables – how about you? Thanks for including my Ham, Cheese, and Olive Bites! This is a great roundup! You are so welcome! They definitely look like something I’d bring to a party – I LOVE manchego! 🙂 Happy Holidays! All of these recipes are so perfect for the holidays! Can’t wait to try them out!! !